Need to know who’s coming and going on your Tulsa or Oklahoma City property? Tulsa Home Guard can install a security gate at your home or business and give you complete control! you know exactly who is coming in or out. We have several types of access control systems to meet your needs, including card and proximity readers, keypads, and telephone entry systems. Each one has different features and benefits, but they all provide a high level of security and protection for your home or company. Our systems are equipped with leading edge technology. 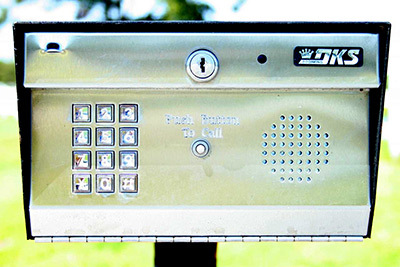 Not only do they enable you to control who has access to your property and how each person gets in or out, but they also allow you other security options, such as selecting the time of day each gate can be used, how often each person can enter, and the number of times each point can be accessed. If you currently have a gate installed by someone else but aren’t satisfied with your access control system, we can take care of your problem! Our trained technicians are able to remove your previous system and install one from Tulsa Home Guard. If you’re ready for a higher level of security at your home or business, let Tulsa Home Guard help! Contact us today at 918-584-4923 for a free, no-obligation consultation!